Just like a thief in the night, it sneaks up on you, that niggling little voice that erodes your self confidence and leaves you wondering if you are doing something wrong or possibly not doing anything right. The next thing you know you are thinking that you will never reach your goals. Self doubt happens to all of us, and it seems to love the job it has taken on of tormenting us. It's mean voice loves telling us that we can never be successful or have our dreams. It laughs at us when we make a mistake or take a misstep. It compares us to others whom we perceive as being more successful. We don't have to listen to that voice, though. When self doubt rears its ugly head, we have to remember all of the things we have accomplished in our lives. Remember that all of the missteps we took led us down a better path. 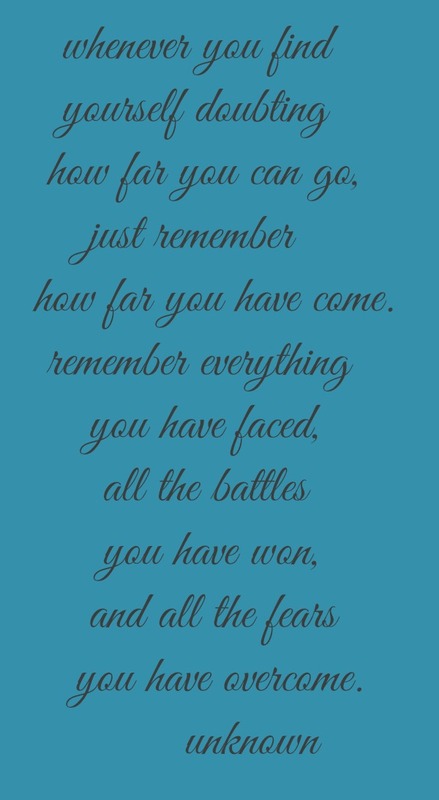 Remember all of the times we have faced fear and conquered it. When self doubt starts to whisper in your ear take a step away. Find a place of peace to sit quietly. Listen to the positive thoughts instead of the negative ones. Meditate . Look inside and find your inner peace. Know that you are the expert on you. You are never alone in your self doubting. It is something that we all face in our lives, but remember that you, not that voice of self doubt, are in control. P.S. You can find more of the Rewriting Life series here and more Inspiration on a Monday here. So true! It's nice to be reminded that everyone (not just me) faces this from time to time. What helps me with that is to remember that we all have a journey that we're supposed to be on. So, my journey in life isn't going to look like someone else's exactly. That way if I start comparing myself to someone else I remember that is their journey and this is mine! We all reach our goals at different times in our life and our goals will change as well. Let life be a journey not a destination. Very wise words, Kelly. We so often forget to enjoy the journey as we worry about the destination. I think we all struggle with self doubt during our lifetime. Good post. It is definitely a part of human nature. Katie. I am going to sound redundant but that is a great post. Thank you Laura. Yes, unfortunately self-doubt and negative thoughts rear their ugly head. I can get really down on myself. Trying to think positively and meditating are good suggestions - I do both. Treating yourself with extra kindness - maybe a hot bath, manicure. yoga, a massage, reading a good book, taking a walk...all things that help. Finding some quiet time is perfect, Cynthia. Those negative thoughts that haunt us, tell us that we failed, we could have done better, why did we say that...have the ability to really get a hold on us. Thank you for sharing these steps on how to be kind to ourselves and also to reassure us that we are not alone. Very comforting. Laura, if you have put this on your FB page, I'm going to share it with a few friends. Very comforting. Eeeewh! You said that perfectly. Self doubt is an ugly thing. Comparing ourselves to others is the worst but as I try to teach my kids that everyone has their own way of achieving success, it is still hard to rememeber that as an adult. Thanks for you inspiration.